[Culver] lives in southeastern Minnesota and is still active in preaching, writing, and presenting papers at the Evangelical Theological Society, was originally from the Yakima, Wash., area. Recruited by Alva J. McClain to enroll at Ashland (Ohio) College, Culver was present at the legendary prayer meeting in J. C. Beal’s home where Grace College and Seminary–and by extension, the Fellowship of Grace Brethren Churches–were born in 1937. A portion of the story from Desiring God appears below. Click here to read the entire post. It felt as though we were traveling back in time. Snow was falling, the roads were icy, and civilization was in the rearview. 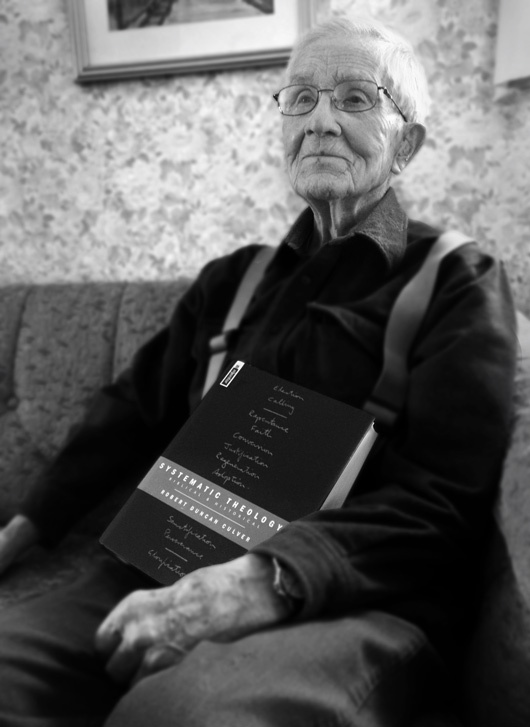 Tony Reinke and I had landed an interview with a 96-year-old theologian tucked away in rural Minnesota, and now we meant to make good on it, despite the distance and wintry weather. We knew we were in for a memorable day. Robert Duncan Culver is the only surviving founding member of the Evangelical Theological Society — and his mind is sharp enough to recall his membership number was 158. He taught a combined 25 years at Wheaton College and Trinity Evangelical Divinity School, and stirred up his share of controversy. He knew evangelical stalwarts like Kenneth Kantzer (1917–2002) and Carl Henry (1913–2003) and John Gerstner (1914–1996) — especially Kantzer (more on him later). And he still remembers the details, down to the exact dimensions of the house of worship he built with his own hands while planting a church in Ohio in the early 1940s.